I've just learned that the New York market will now receive the Dallas-Washington game on Fox opposite the Chiefs-Jets on CBS. What does that mean? It means a hit on TAR's ratings for this episode in the nation's biggest market. With the Jets being pitiful this season and a lot of Cowboys fans living in New York, this means a lot of attention away from CBS in the late game. Hoo boy. This news is so fresh that even the NFL Coverage Map for Fox hasn't been updated. I'll post this over in the ratings thread as well. This is off spoiler topic, but football related. The FOX Dallas-Washington game will have little impact on Sunday evening's TAR episode. The game that will impact TAR viewership is the New England - NY Giants game that has an 8:15 pm kickoff. This game was slated for NFL Network, but because New England is chasing a perfect 16-0 regular season, the NFL is broadcasting the game on NFL, NBC and one other network (FOX or ABC). I'm done ... how about more spoilers that will help my TAR game. And its CBS that will have it also. What Mama said. New England/Giants is tomorrow and won't impact TAR's ratings. The Sunday night game is Tennessee-Indy on NBC. From my blog, the last and definitive word on the NFL double doubleheader situation for this Sunday. Ok, back to your regularly scheduled thread. At 1130pm on July 23, I expect that teams would be near the completion of a 12 hour pitstop in the Mumbai metropolitan area, so even if there was a small amount of rain the effect on them would have been negligible. I expect that their next task would be going to the Mumbai International Airport to fly to Japan or Taiwan. I sure hope your right apskips, I'm pretty much sick of India. Beautiful people but what an ugly country, at least thats what I see after looking at thousands of pictures. Well I would not agree with that, puddin. I was there for 3 weeks and travelled 8000 miles by train over much of India(it's vast, so it would take months to see it all). There is incredible poverty, with begging happening almost everywhere you will be going. However, there are many serenely beautiful places and there is an interesting culture so different from anywhere else on the globe. If you go to India, you will be entranced by the beautiful places and you have to brace yourself for the poverty and the congestion of the major cities. To get the beauty you have to live with the negatives. 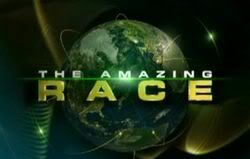 We get a little bit of the beauty on The Amazing Race, but what India has is really spectacular. It will not be found at Bollywood or in the markets of Delhi and most surely not in Kolkata and not in downtown Chennai. Try Agra, try Jaipur, try Udaipur, try Goa, try the temples south of Chennai, try the majesty of Varanasi. There are hundreds of places, not you won't typically find them in the metropolitan areas where World Race Productions has set the race courses. I shouldn't have wrote the country is ugly, just certain areas apskips such as Mumbai. It's a shame that those once beautiful historic, majestic buildings have been forgotton. I guess, in my mind, I was hoping that we would see some place more exotic and was actually holding out for the Maldives, Jaisalmer, or Kerala to name a few. Yeah IA with you puddin -- there are a lot of beautiful places in India but they always go to the ghetto ugly places. Yeah, too bad the producers always use India as "the Cultural" Shock of their season (Or someplace like Thailand or Vietnam in other seasons), something to really put racers into uncomfortable places and see how they react and hold together. And while I do like that, I think they could (or should) also show the beauty and the more reflective areas of said countries. Which they often do with Vietnam and Thailand, but not really India. Speaking of shocking, why oh why is Rachel letting TK do another Roadblock? Calling all ferns!! puddin -- I know this is OT but we don't really have much to talk about, you have a lot of sources -- have you heard anything on TAR13? I'm getting the usual "TAR is almost ending and I have to wait forever to see a new season" feeling. Wow. I'm absolutely appalled. I understand what you all are trying to get at, but c'mon, try to be a little tactful. Yeah, don't be like Kendra. hey -- ghetto does not = retched and disgusting! I miss her like I miss a hemorrhoid. "WHEN I FIND OUT WHO DID THIS...ONE OF YOU IM GONNA BREAK IN HALF"
It's funny Michael I used the comparison this week in the recap, Kris & Jon with no racing skills. And I have a bad feeling we are in for a long, long dry spell. Unless they start filming by the very part of February then at best a summer run, but most likely a fall run. And damn, thats a long ways a way. Enough all ready yet: enough about monsoons, train rides, ugly countrysides, football games, overruns, eetc. Don't nobody have any ideas at all of what the heck is going to happen tomorrow night? What little do we have? Leave Florence in the wee hours of the morning; get ye to the airport. Fly to Mumbai India any which way you can. Take minicab at night to next location; wait for hours of operation. Bunch up and spend the night. Detour: decorate the wall or decorate the elephant. Not much but seems to be all we have. Instead of Kris/Jon, they're the new Ray/Yolanda. Navigationally challenged, but good at the tasks and with a serious problem in roadblock division (Ray did skydiving (?) and bungee jumping (??) which left Yolanda to perform the final 3 roadblocks). After this leg he has one more roadblock left (I might do some roadblock analysis for this season). As for the second stop in India, maybe it's half of the next leg - pit stop at Mumbai, fly to/take a train to Kerala (or wherever), do the RB, fly to Taiwan/Osaka, do the detour, go to pitstop (and nonelimination most likely). GMAN, I think that's about it, though the detour and roadblock could be reversed.